Physically-based models are frequently applied for local landslide analyses and predictions in order to prevent the potentially disastrous consequences of slope failures. Limit-equilibrium modelling approaches are very common. However, the application of such models can be very time-consuming, and due to its two-dimensional nature, it generally has to be repeated for each profile that is investigated. We have implemented CHASM within a web-based GIS (Geographical Information System) environment for a study area in the Swabian Alb, Germany. The implemented CHASM decision-support system is based on open-source software and utilises the WPS (web processing service) standard to execute the model algorithms on a server. The presented system allows the user to select from a variety of input data and model parameters to quickly perform limit-equilibrium analyses of slope stability. Simulation results are automatically stored to a database and can be visualised for interpretation. The implemented CHASM decision-support system represents an innovative prototype, and demonstrates a promising approach for landslide warning systems where there is robust geotechnical data to drive such applications. 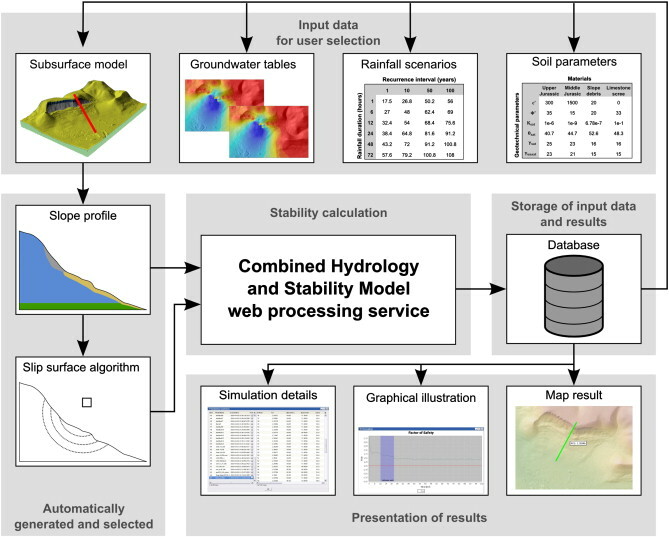 Thiebes, B, Bell, R, Glade, T, Jager, S, Anderson, MG & Holcombe, EA 2013, ‘A WebGIS decision-support system for slope stability based on limit-equilibrium modelling’. Quarterly Journal of Engineering Geology, 158,109-118.